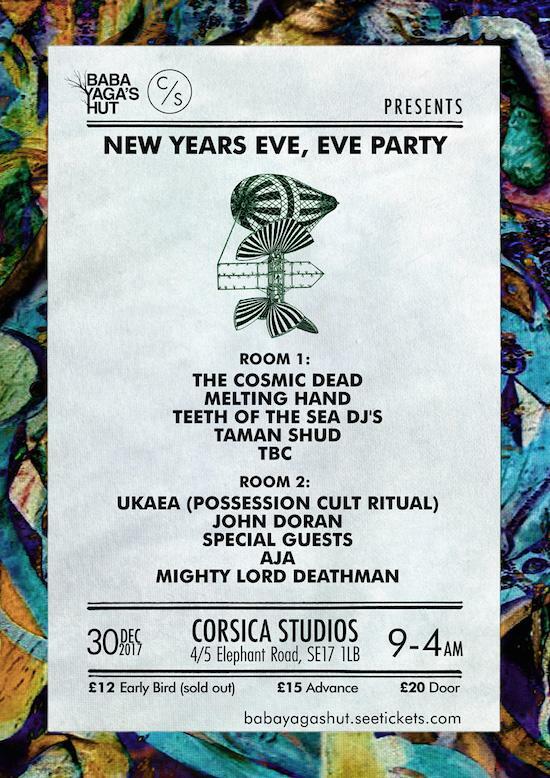 London's premier purveyors of rock music of a heavier disposition Baba Yaga's Hut are lining up a special end-of-year 'New Year's Eve, Eve' party to take place at Corsica Studios on December 30. Taking place across the London venue's two rooms, the party will be headlined in room one by The Cosmic Dead and Melting Hand playing live with support from Taman Shud, Teeth of the Sea DJs and one more as yet unnamed act. In room two, UKAEA will play what is being billed as a 'Possession Cult Ritual', with support from our John Doran DJing, as well as Aja, Mighty Lord Deathman and special guests. Tickets are on sale now for the party, so if you fancy getting in one last night out before the New Year's celebrations or skipping them all together, head here for more details.